Here at the Good Tymes Barn we specialize in barn weddings, receptions and wedding showers, indoors and out. Why use Good Tymes? 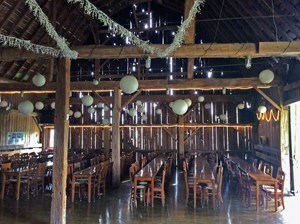 The Good Tymes Barn offers open beams, wood floors, antique wood tables and hand-caned oak chairs (done by the owner), the barn offers guests the authentic ambiance of the good ole days in rural America that you can’t get anywhere else in the state of Michigan! Perfect for your Michigan Barn Wedding. Please visit our Barn Rental page for additional information. Good Tymes is ideal for a memorable and unique wedding and reception atmosphere. Call 810-387-4344, call/text 810-388-4970 or email us today to discuss your special day!